Glengorm Castle lies approximately 8.8 km from the junction with the B882 Tobermory to Dervaig road. Situated on the northern tip of the Isle of Mull, it has commanding views of up to 80 km to the Outer Hebridean islands of Uist, Rhum and Canna. 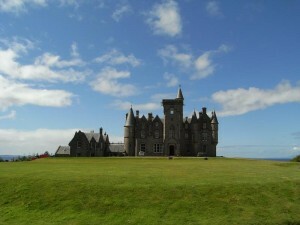 The castle was built in 1860 by James Forsyth of Dervaig. It is said that the laird asked a local woman what she thought would be a good name for the castle. She suggested Glengorm and he agreed, obviously not knowing that this was the Gaelic for Blue Glen – a reference to the blue smoke that filled the air when so many of the houses were burned down. Legend has it that one of the evictees put a curse on James Forsyth saying he would die before the castle was finished. In 1863, just before completion of the castle, he was killed in a riding accident and his son inherited the property.